Zigy, an online pharmacy startup founded by former Infosys director and IGATE CEO Phaneesh Murthy, is scaling back its operations due to a paucity of funds but has no plans to shut down, a top executive said. "We are not shutting down," Zigy CEO Hemant Bhardwaj told TechCircle. He was denying a report in The Economic Times that said Zigy, owned by PM Health & Life Care Pvt. Ltd, might halt operations within three months as it had been unable to raise funds. Bhardwaj said the company is "strengthening" itself in Bengaluru, where it will be operational for retail customers. "For institutional customers, we are operational in all five cities (Bengaluru, Chennai, Hyderabad, Mumbai and Delhi)," he said. The company earlier catered to retail customers in all five cities. Bhardwaj also denied that the company was looking for a merger to exit the business. "There is no merger situation at this point in time. We would like Zigy to thrive on its own. Seven to 10 months is too early to decide to merge a company. We will keep all opportunities on the table and keep exploring," he said. The Economic Times, which cited three people aware of the development it didn't name, also said that regulatory restrictions had hampered the company's growth. Zigy.com, a marketplace that connects chemists with consumers, was launched in August 2015 by Murthy as part of a health exchange platform that also included Zigy Health Vault, a patient-controlled health record system. Murthy, who was sacked from IGATE over sexual harassment charges, was reportedly looking to raise $10-12 million for Zigy. Zigy also competes with the likes of 1mg and Netmeds.com, among the biggest and the most-funded online pharmacies. 1mg raised $15 million (Rs 100 crore) in a Series B round led by Maverick Capital Ventures and existing investors Sequoia Capital and Omidyar Network in April. Netmeds received investment commitment of $50 million (Rs 325 crore) from healthcare-focused global private equity firm OrbiMed, among others, in October 2015. 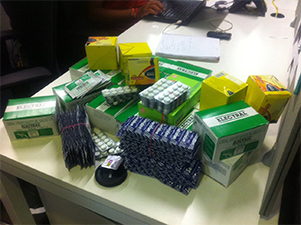 CareOnGo, a chain of co-branded online pharmacies, raised pre-Series A funding in April.